Start collecting those Paint Cans. A new camo progression system went live yesterday in Call of Duty: Black Ops 4’s battle royale mode, Blackout, for PlayStation 4 players. The system introduces Paint Cans as a new item in Blackout. 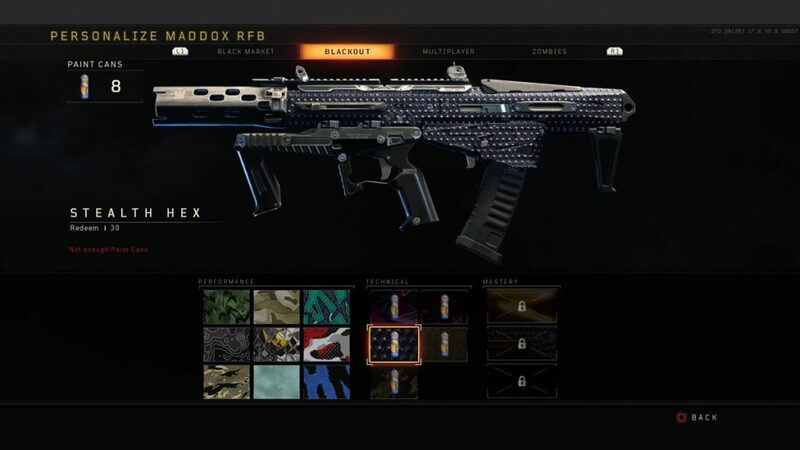 Players need to collect Paint Cans and use them toward unlocking camos for each individual gun in Blackout. This new progression system is different from the one in multiplayer—so any player who unlocked Gold, Diamond, and Dark Matter in multiplayer will have to do it all over again in Blackout. How exactly do you get these camos in Call of Duty’s battle royale mode, though? 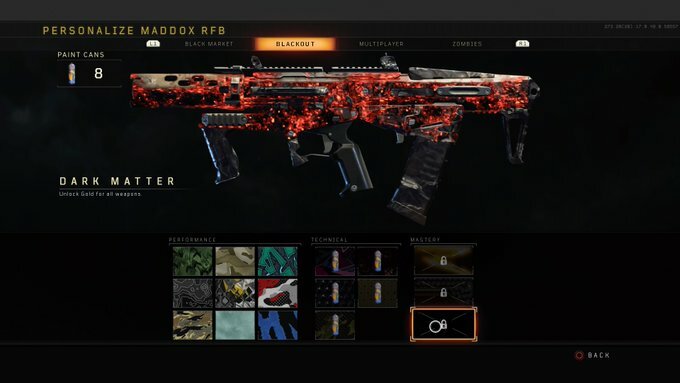 Here’s what you need to do to unlock Gold, Diamond, and Dark Matter in Blackout. The first step in this lengthy process is to get Gold camo. You’ll need to unlock the nine camos in the Performance category by picking up a certain number of Paint Cans and redeeming them toward that particular camo. Here’s how many Paint Cans you need for each camo in Blackout. This means that you’ll need to collect 120 Paint Cans per gun in order to unlock all nine Performance camos. Once you have Blue Tiger, you’ll unlock the five challenges in the Technical category. Unlike multiplayer where you need to do unique tasks for the Technical category, in Blackout you simply need to collect more Paint Cans. This means that you’ll need an additional 150 Paint Cans per gun in order to unlock all five Technical camos—so it’ll take 270 Paint Cans to get Gold camo for each gun. After you’ve completed all five Technical challenges, you’ll acquire Gold camo on that specific gun. Congratulations, but you still have a long way to go. In order to unlock Diamond, you’ll need to get Gold camo on every single gun in that respective weapon class. 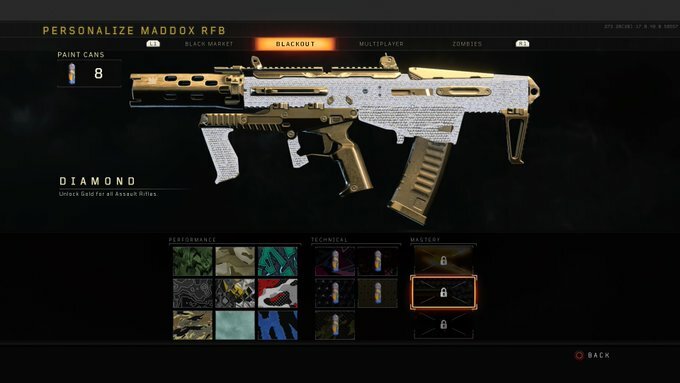 So, if you want to have Diamond for your assault rifles in Blackout, you’ll need to complete the Performance and Technical challenges to unlock Gold camo on every AR. 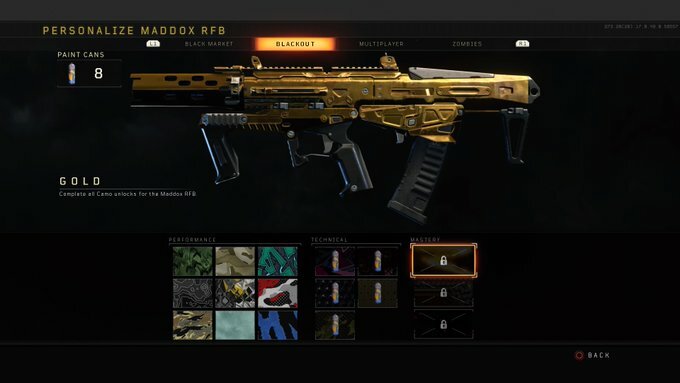 And then, if you want to unlock Dark Matter in Blackout, you’ll need to get Gold camo on every single weapon in the game. This isn’t going to be an easy process, but it’ll feel very rewarding if you eventually get Dark Matter in Blackout.